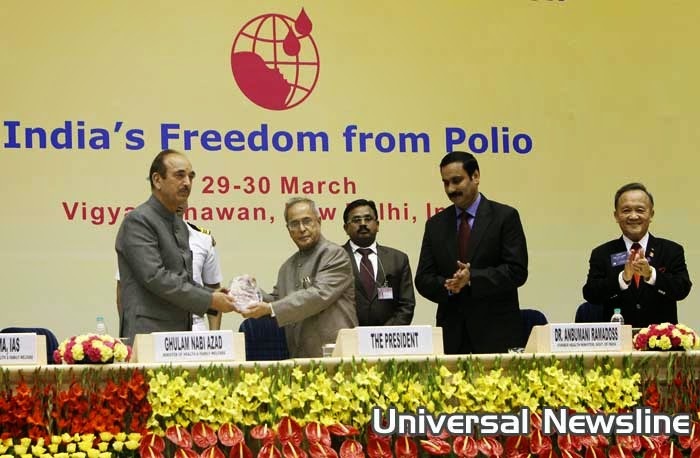 Vigyan Bhawan, India: India and Southeast Asia on March 27, was declared polio-free by the Regional Certification Commission for polio eradication. To celebrate this historic milestone Rotary International hosted ‘Polio Free Conclave 2014’ at Vigyan Bhawan. The Hon’ble President of India inaugurated the two day celebration of Southeast Asia achieving the regional Polio-free certification. Union Minister of Health and Family Welfare Hon’ble Shri Ghulam Nabi Azad was the guest of honour who was joined by Rotary International World President-elect Shri Gary C.K. Huang and Chairman of The Rotary Foundation Shri D.K. Lee. More than 1200 participants including Health Ministers and delegates from neighboring and SEAR (South East Asia Region) countries, representatives of global organizations and Rotary members from across the world joined the event to celebrate and renew Rotary’s commitment to ending Polio from the world. Hon’ble Shir Pranab Mukherjee congratulated India on the incredible success. The two-day Conclave on Polio is being organized with the objective of celebrating India’s trailblazing success and at the same time to build momentum for the global movement to end Polio by 2018. The conclave will deliberate upon the challenges existing, the lessons from India’s campaign and the way forward for the global campaign, particularly in the three Polio endemic countries – Pakistan, Afghanistan and Nigeria - to ending Polio. The Conclave will have participation of think-tanks, leaders and public health experts from across the region. Rotary International endeavours to make this event an ideal platform for delegates from neighboring countries – Pakistan, Sri Lanka, Nepal, Nigeria, Bangladesh & Afghanistan – to share their experience and the lessons learnt by the campaign in India. In the next two days the participants will attend sessions with speakers from different sectors of public health and social change from India and abroad. This historic milestone of WHO declaring India as Polio-free comes as a remarkable achievement for a nation that saw more than one lakh babies crippled every year. The success in India is also seen as boosting the global campaign to end Polio. The message being, “If India can, the world can.” Until 2009, India accounted for more than half the world's polio cases. India however remains at risk of poliovirus importation and needs to ensure vigilance at all times to rapidly detect and respond to any case of polio as a public health emergency. The country also needs to identify vulnerable areas and populations and ensure that actions are taken in these areas urgently to build up the immunity of children through polio campaigns and routine immunization to mitigate the risks associated with importation of the poliovirus.